Mozambican soldiers join exercises as part of the African Union's African Standby Force (ASF) at the South Africa National Defense Force's Lohatla training area, Oct. 27, 2015. 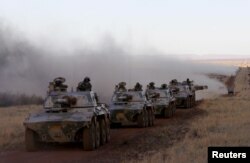 Backed by tanks, armored vehicles and plenty of EU cash, thousands of African soldiers took on an imaginary enemy in the arid heart of South Africa last week, the last joint exercises before a homegrown continental strike force goes live. Standing on far-away hilltops, commanders peered through night vision goggles and issued orders through helmet-mounted radios to the 5,400 troops simulating a dawn assault on rebels in the fictitious city of Kalasi marked out in the bush. The orderly maneuvers and high-tech kit elicited purrs of approval from military chiefs who tout the rapid-reaction battalion - a key part of a long-awaited African Standby Force (ASF) - as the antidote to insurrections spiraling into civil war or even genocide. "This is an important milestone in our endeavour to create a tool that will be at our disposal should we require to intervene to quell violence," South African Defense Minister Nosiviwe Mapisa-Nqakula said at an opening parade. But analysts say the ASF, which attains "full operational capability" in December, still faces two major challenges: funding, and forging the political agreement among 54 countries to send in troops - if need be without being invited. "The big elephant in the room here is political will - the will to deploy without national consent, for instance," said Thomas Mandrup, an expert in African security and governance at the Royal Danish Defense College. Under original African Union (AU) plans, each of the continent's five regions - north, south, east, west and central - are meant to provide a brigade of 5,000 troops to the force. But in a sign of potential divisions, North Africa sent only staff officers to this month's exercises, not troops, a reflection of the domestic political turmoil in the region. Without the likes of Egypt and Algeria, the ASF will lack much of the air-lift capability crucial to any rapid deployment. Instead, ASF operations are likely to become a "coalition of the willing", Mandrup said, much as South Africa, Tanzania and Kenya have done in United Nations-backed peacekeeping and intervention missions across Africa. Recent security crises in Africa include coups in Guinea-Bissau, Mali and Burkina Faso, offensives by Islamist militant groups in Mali, Nigeria and Somalia, and conflict between rebels in eastern Congo and Central African Republic. The polished nature of last week's war games stood in contrast to decades of underinvestment that has left African armies poorly equipped and trained, blunting the AU's ability to launch speedy responses to political or humanitarian crises. Nowhere was this more evident than Mali in 2013 when former colonial power France, rather than the AU, rushed in troops and planes to block the advance of Islamist jihadists sweeping south from the Sahara. Since 2004, the European Union has committed more than 1.3 billion euros to African peace operations, including 225 million euros in 2014 for missions to Somalia, the Central African Republic and Mali. In all, more than 90 percent of AU peace and security efforts are funded by the likes of the EU and United States, although AU member states have pledged to provide a quarter of the funding for operations by 2020. However, the concern remains that if Africa does control the purse-strings of the military force, it cannot control the outcomes. Underlining the problem, the EU was even bankrolling the October exercises, casting a shadow over the "African solutions for African problems" mantra espoused by politicians in national capitals and the AU headquarters in Addis Ababa. "The external support for defense spending in Africa is, in my view, a major foreign policy handicap," said David Anderson, professor of African history at Britain's University of Warwick. "African states will truly own their defense and security when they pay for it themselves," he added. "There is no greater marker of sovereignty and independence than security and defense."